I've loved the books in the Ribbon Ridge series and The Idea of You didn't disappoint. It's the story of Evan Archer, one of the more elusive siblings. In each book, we've seen that many of the Archer children has socially-related struggles and the same is true for Evan. He suffers from Asperger's Syndrome, albeit milder than some I've known. The author does a great job of depicting Evan's Asperger's, including his inability to read social cues and his struggles with large groups and loud noises. I really thought it was well done because Even was very straight forward with Alaina about things that she could otherwise misinterpret. It took them a while to navigate how to make a relationship work and the struggles make Evan endearing to the reader. I thought Alaina was incredibly grounded for a Hollywood starlet and I appreciated how down-to-earth she was. Even the "Hollywood" aspects of the storyline, to her, were just run of the mill. She didn't come to Ribbon Ridge looking for a relationship but I love how it found her when she was least looking for it. I found this book very realistic. Evan's perceptions and understandings about his family were very realistic, as were his struggles with Asperger's. Alaina's desires for the future and her "go get em" attitude to meet her goals was relatable. We also were given the chance to check in with our favorite Archer couples! Ribbon Ridge feels like home. Evan and Alaina's story is about seeing past the facade and getting to know the person underneath. The least likely people to have anything in common are the two that are most alike. Evan is more of an introvert who never felt like he belonged within his big boisterous family. Alaina has the career and life she has dreamed of but is feeling smothered. The Idea of You is about making tough decisions, facing fears and paving a path right for yourself. Whenever I visit Ribbon Ridge it feels like the first time. Wonderful series. Going back to my favorite place Ribbon Ridge. 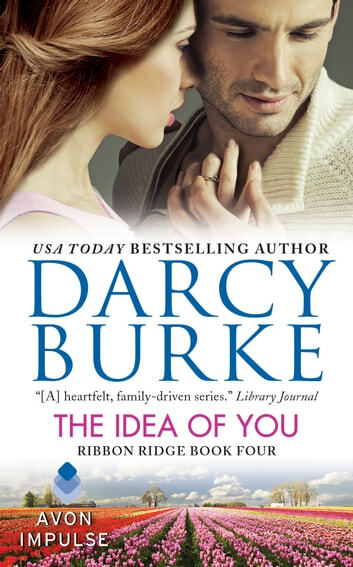 The Idea of You by Darcy Burke, is my favorite story in the Ribbon Ridge Series, so far. Absolutely loved going back to Ribbon Ridge with Evan and Alaine. Darcy has made these characters and town so real you feel like you know the them and want to live in Ribbon Ridge. I was smiling from ear to ear one moment and the next I am sad and feeling the characters pain. This is a must read, it can be read as a standalone, but I highly recommend reading the series. I am so happy there are more books to come. Darcy Burke is one of my favorite authors. I was given an ARC of this book, for my honest review. Alaina Pierce is an award-winning actress who may have had her fill of the Hollywood scene. She is looking into in vitro fertilization and thinking of her future. Then it hits the fan. Paparazzi has pictures of her coming from the office. of the gynecologist that is helping her and speculation is off the charts. Alaina needs a place to hide out and quickly! Her production partner Sean had the perfect place for her to hide. They were in business together starting their own production company and one of the first things they were doing together was a show in a place called Ribbon Ridge. Sean sets it all up for Alaina. All she had to do is slow up. The family (Sean's family) are very kind and they would be happy to have her stay, and keep it a secret. Alaina meets Sean's brother in law Evan and sparks fly, but he is different from the people she knows, he is straight forward and a little standoffish. But even be can tell there is an attraction there. Evan has issues. He is on the autism spectrum and sometimes has difficulties with too many people in a room or over simulation. He works hard to keep it in check, but it isn't easy. When he meets Alaina, she seems nice, and she likes that he is direct. He wants to be friends. This story is beautiful! The people involved are complex people with imperfections, but they see past those things. The writing is absolutely fantastic. I was on the edge of my seat half the time and smiling the other half, with a sprinkle of emotion throughout. This is the kind of book you read again and again through the years just to feel like you are not alone. Darcy Burke totally gets relationships! Whether it's family, parental, siblings or dating, she just has a way of writing the story so vividly that you feel like you know these people. This is the 5th installment in the Ribbon Ridge series of you count in the prequel novella and I know I will cherish the characters as much as I do Elizabeth Bennet and Mr. Darcy. Not everyone can write memorable people, but Darcy Burke does it very well. I highly recommend this series! Start at the beginning (though it's not necessary) you will love these characters too! What's not to love about this book? With great characters, a sweet romance and a close-knit family , THE IDEA OF YOU is a really beautiful story about a couple's decision to make their relationship a success in the face of her fame and his limitations. Alaina Pierce needs a place to lay low and avoid the media and the idyllic town of Ribbon Ridge, Oregon is just the place to do so. Alaina finds herself loving the charm and beauty of the town but the most attractive thing about Ribbon Ridge is Evan Archer. With his gorgeous movie-star looks and his lack of guile, Evan is definitely different from the men Alaina is used to and very appealing. Add in the fact that he comes with a large and loving family and leaving Ribbon Ridge might be harder than she thought. Evan's whole life has been defined by his disorder but somehow Alaina does not consider that to be a deal breaker and enjoys his company. For a man who always prefers peace and quiet, Evan finds himself spending a lot of time with her and wanting to know her more. I love everything about this book: how Ms. Burke was able to portray Evan's Asperger's Syndrome, his sensory issues and his inability to read social cues; and how she captures Alaina and Evan's relationship challenges and how they navigate them so well. They were not looking for a relationship but I love how they adapted to things changing between them and how those issues that should have divided them instead brought them together and forged a very tight bond between them. From the first page I loved both Evan and Alaina, their honesty with each other, the ease of their relationship and I really loved how down-to-earth and easygoing Alaina was for a famous actress. I have loved this series from the very first book. I think that Ms. Burke has done an amazing job with the characters and all the issues they face and I look forward to the upcoming stories. If you love family-themed romances, this is one book you should add to your reading list. Disclaimer: I received this book for free from the Publisher in exchange for an honest review. This does not affect my opinion of the book or the content of my review.